In general, most countries have at least three basic requirements for naturalization, including: (i) must live as a full-time resident for a minimum period of time in the country, (ii) must promise to follow all the country’s laws, and (iii) must pledge an allegiance to the country. Some countries also forbid dual citizenship (i.e. you must give up the citizenship of one country to receive your new citizenship). In the United States, Article I, Section 8, Clause 4 of the U.S. Constitution grants Congress the power to establish naturalization laws. As such, Congress passed the Immigration and Naturalization Act which sets forth the legal requirements for U.S. naturalization and citizenship. The U.S. Constitution requires that only natural born citizens can be President or Vice President of the United States. 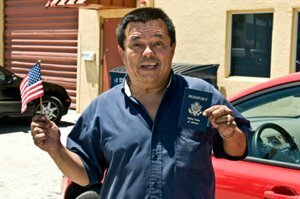 As such, a person who becomes a U.S. citizen through naturalization cannot become President or Vice President of the United States.